Nokia has released the update for Nokia Browser for S40 devices to version 2.0. Nokia says it is a major update and the new version reduces data consumption by up to 90% and websites load up to three times faster. There is a new intuitive start page, users can easily share files and links across social networks and the new Download Manager helps consumers to manage external content easily, saving music, video or pictures on a memory card, while surfing the internet. The browser includes a revamped, modern user experience that makes it simple to find, install and use interesting web apps that offer a richer, more desktop-like internet experience. Nokia Browser 2.0 makes use of cloud-based servers which adapt standard web pages so that they perform better on Nokia Series 40 devices. With this update, developers will find new monetization capabilities, more extensive user interface options for their web apps and productivity improvements for Nokia Web Tools so they can continue delivering engaging, connected experiences to the ‘Next Billion’ consumers. The new update will be supported by all Series 40 handsets including touch, QWERTY and non-touch devices including the Nokia Asha range. User can download the new Nokia browser from the Nokia Store over here which is available available in 87 languages. Faster browsing with speed improvements throughout the experience. 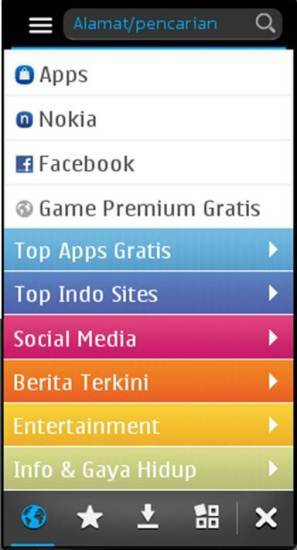 Easier access to new and popular Web apps to enable a richer and more engaging internet experience. New, intuitive user interface offers one click access to search, most popular content and most valuable features. Media handling enhancements provide an easier way to enjoy video, audio and images. Users can download in background mode while continuing to browse the web or queue downloads for later when performance or rates are better. Downloads can be saved to memory cards or phone memory for later offline viewing or listening. One-click share on Social Networks by remembering Facebook and/or Twitter login to easily share any page URL and comments from your browser.